Products are 100% Organic and recommended by Brian Peskin! Satisfaction guarantee on all products. Please read our product purchase policies. Purchases will show credit card charges from Healthy-Living.Org (our parent company). To purchase an item, enter a quantity into its field and click on the Add to Cart and Checkout button. by Brian Scott Peskin BSEE-MIT and Robert Jay Rowen M.D. With a total of 534 pages, this is one of the most amazing reads available today. Shows the science behind why unadulterated seed oils are among the most important foods people should eat if they want to stay healthy. Written for both Medical Doctors and Lay Persons. 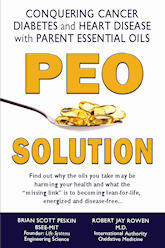 You will never look at health the same after reading this book. Pricing: Retail: $42.50 Our price: $37.50 Read what doctors have to say about this book!